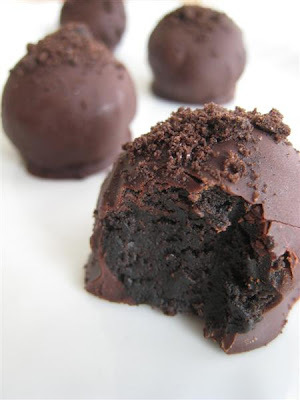 As promised here is the recipe for the Oreo Truffle Balls I made over the weekend. These were insanely good and so easy to make! I think they would be adorable to serve at a shower or birthday party. Although beware this is what happens when a hungry baby gets his hands on the Oreo balls. My oreo balls don't look quite as pretty as the above picture but I can assure you they tasted amaze. SHAPE into 48 (1-inch) balls. Refrigerate about 30 minutes. Dip in melted chocolate; place on waxed paper-covered baking sheet. Sprinkle with remaining cookie crumbs. yeah, we're gonna have to talk about you posting recipes like this during swim suit season. How about keep it to Gywnnie salads until I can hide behind puffy vests and long sweaters! HA! LOVE LOVE LOVE these crazy yummy addicting little balls! I'm sure your the readers favorite today!!! Can't wait to try your latest recipe, Natalie! Thanks! If little man is any indication, these are gooood! I make these (haven't in a while) and they are sooo yummy!! I always have a problem with getting them to look pretty. We must find a solution. How do the pros do it? Holy, yum! Those look amazing! Yum, can't wait to try these--if Little Man approves, so do I, hehe! this is exactly why I just added you to my blogroll!!! i don't want to miss out on this goodness! Can "yummy" even describe these bad boys??? The answer is definitely a "NO!" I mean seriously, can you combine oreos and chocolate and not come out with something amazing?!?! Holy delicious! I'm afraid to make them b/c I will eat them all!!! those look so yummy. I could probably eat 50! EEK! Sterling is cracking me up...how cute! I seriously have to stop looking at recipe blog posts so early in the morning!! Love the Oreo truffles. If you haven't already, try them with the mint Oreos. OMGGGGG these look so flippin delish!!! And your little one is just as precious as ever! Ummmmm I need to make those. stat. I'm drooling. No fair! You can not tease a pregnant lady with OREOS!!!! I am dying over how good these look!!!! Looks like Sterling loved them! He is too adorable!! Orea truffle balls?! What a fun treat!!! And your little one is ADORABLE.